Eurostar, the high-speed rail link between the UK and mainland Europe, is trialling a unique new way to bring the capitals of London and Paris even closer together teaming up with Boomerang. This new online platform puts Eurostar travellers in touch with each other to help them get the little things they miss most from across the Channel. Users can connect with fellow Eurostar travellers and request the small but much-loved things they can’t get in Paris or London. From that French moisturiser to this traditional English cup of tea, Boomerang is perfect for passengers who don’t want to wait until their next trip to get that special something. Boomerang is being trialled for three months on Eurostar services between Paris and London. Once registered, users can enter the details of their request on the platform and connect with travellers who have offered to bring their chosen item over. Register on the dedicated Facebook application and follow these steps. Step 1: Browse the suggestions made by our travellers or list your own and select a date when you want this item delivered. Step 2: Set a price and submit your request. Then just wait for a lovely traveller to make an offer. Step 3: Accept an offer and make a payment by PayPal. It will be safely held until your item's delivered. Step 4: Arrange a delivery time and location with your friendly traveller. Step 5: Meet up, collect and mark your item as delivered in Your Orders. Enjoy! Step 2: As soon as you offer to bring over an item, we'll tell the requester. Step 3: Once your offer's been accepted, you'll get the other person's email address. Step 5: Meet up, mark the item as delivered in Your Orders and you'll be paid right away. Payment is made through PayPal and held until both parties have confirmed that the item’s been delivered. 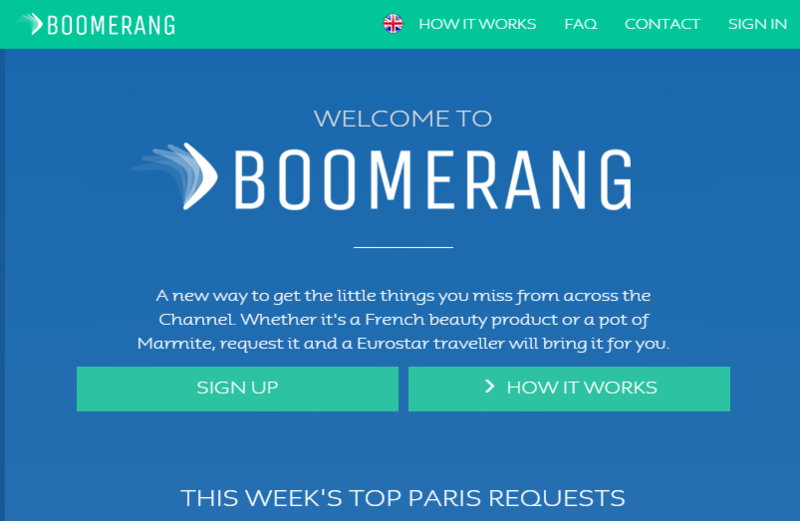 Boomerang is entirely free to use and Eurostar doesn’t take any fee on delivery.